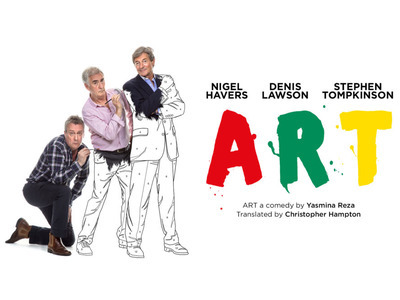 On Saturday 24 February, the French, Art, Drama and TOK departments took the L6 and U6 students to watch a French play called ART performed by Nigel Havers, Denis Lawson and Stephen Tompkinson. The play written by the French author, Yasmina Reza raises questions about art and friendship. Set in Paris, the story revolves around 3 friends- Serge, Marc and Yvan who find their steady 15-year friendship on the verge of collapse when Serge buys a white painting worth £200 000! Cette pièce culte qui fait un tabac à Cambridge est à voir absolument! "ART is a play with a simple concept on paper that develops into something beyond written words on a page. Encapsulating friendship with its highs and lows and sometimes brutal honesty, it’s a refreshing piece of work to watch and you’ll leave feeling like you’ve learnt more about yourself and the people in your life. You’ll probably also leave with cheeks that ache with laughter; while it isn’t the most family friendly play ever written, it’s one that’s full of both intensely funny and moving moments, something that cannot be said for some plays today." "ART est une pièce qui nous porte à l'analyse et la réflexion tout en étant très drôle et divertissante. Yasmina Reza nous invite à considérer deux thèmes qui sont d’une grande importance: l’amitié et comment définir l’art. C'est une pièce succulente; les dialogues sont fins, l'humour fameux, la peinture des différents caractères pertinente, bref, un vrai triomphe que tous devraient avoir le plaisir de lire ou voir!"